Every spring, Jewish families from around the world gather round the dinner table to partake in one of the most celebrated Jewish rituals – Passover. This year, Passover starts on Friday, April 19th and ends eight nights later on Saturday, April 27th. The setting sun commences the Passover seder dinner and members of the community spend the evening consuming symbolic foods and drinks as they recount the story of their people. At the core of Passover are the central themes of slavery and freedom. In short, the seder is a celebration of the story from the Book of Exodus that chronicles the Israelites’ liberation from slavery in Egypt. For decades, individuals of other faiths have embraced this Jewish holiday. Particularly, the story of the seder has resonated with African Americans because the history of their own people has also been burdened with waves enslavement and social injustice. In a Huffington Post article, Rabbi Marc Schneier and hip-hop mogul Russell Simmons expound on Dr. Martin Luther King, Jr.’s instrumentation in bridging African Americans’ plight to those of other faiths and backgrounds during the Civil Rights Movement. The Jewish community wholly accepted King’s connection. 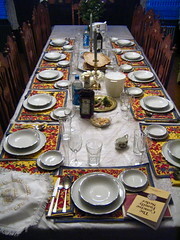 Ever since, interfaith seder dinners have been held throughout the United States. A smaller share of African Americans also observing Passover are those who believe in the Jewish faith. This community – which is 2% of the Jewish population in the US, according to Pew – is comprised of people who have African American and Jewish heritage (and therefore Jewish by birth) or African American individuals who have converted to Judaism. Writer and culinary historian, Michael W. Twitty, is a prominent voice representing African American Jews. His blog, Afroculinaria, chronicles African and African American history through food, occasionally highlighting the fusion of Jewish customs and African American fare. In place of horseradish as the Jewish maror, the bitter herb that represents the bitterness of slavery, Twitty uses collard greens. Also harsh in taste, collard greens are a staple in African American and southern food. Regardless of whether or not African Americans believe in the Jewish religion, those celebrating Passover come together and incorporate culturally significant African American foods into the symbolic seder dinner on the first night of Passover. This inclusive integration of backgrounds and faiths remind us that even within certain groups in our society, the presence of diversity is ever-evolving.